Socialism 2017: Rust Belt Reactionaries? I’ll be at the Socialism 2017 conference all weekend, Thursday July 6-Sunday July 9. On Friday at 2pm I am paired with the excellent Sharon Smith to talk about today’s working class, what the myths and media blitzes get wrong, and what we know about organizing. 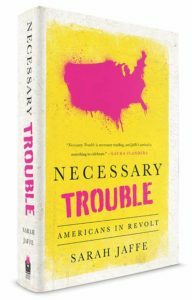 Necessary Trouble will be on sale from the good folks at Haymarket and I will be happy to sign it for you if you ask!